The streets of San-Paro are prowled by menacing villains and trigger-happy vigilantes. With so many experienced killers on the streets, death is big business; and business is booming. The High Roller pack is designed for those who wish to carve a chunk of the wealth out for themselves. Appearance counts for a lot in San Paro, and professionalism will help to put you head and shoulders above the others when it comes to landing that big contract. 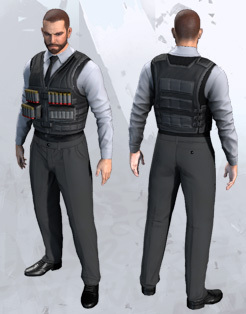 The High Roller pack delivers a range of clothing items that convey style, sophistication and class; while the additional ammo pouches and bandoliers will show that you’re a shrewd operator. Nothing projects “success” like a flashy sports car. The Bishada Spectre is a car with definite racing pedigree; perfect for dashing between firefights and looking good while you do it. The enlarged air scoops, sizable spoiler and multiple exhausts indicate that this is a vehicle that’s designed to go fast. After all, it’s a cut-throat city and if you’re not fast, you’re last. 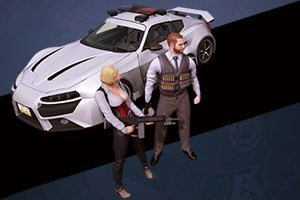 Stay ahead of the game with the High Roller pack.